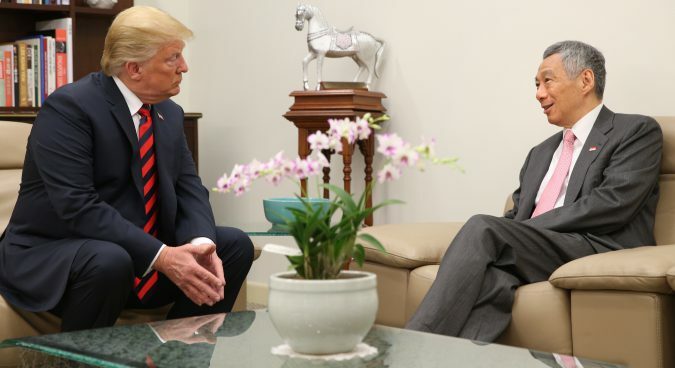 U.S. President Donald Trump met with Singaporean Prime Minister Lee Hsien Loong on Monday, in talks a day ahead of a historic North Korea-U.S. summit meeting. The two met at the official residence of the Singaporean President around midday local time, before holding a lunch meeting at which several other high-level U.S. officials – including Secretary of State Mike Pompeo and National Security Advisor John Bolton – were present. “We do appreciate your hospitality, your professionalism and your friendship,” he told Prime Minister Lee. The meeting follows talks between the Singaporean Prime Minister Lee and North Korean leader Kim Jong Un on Sunday: a meeting which saw Lee praise Kim’s and Trump’s “bold and admirable decision” to hold the summit. 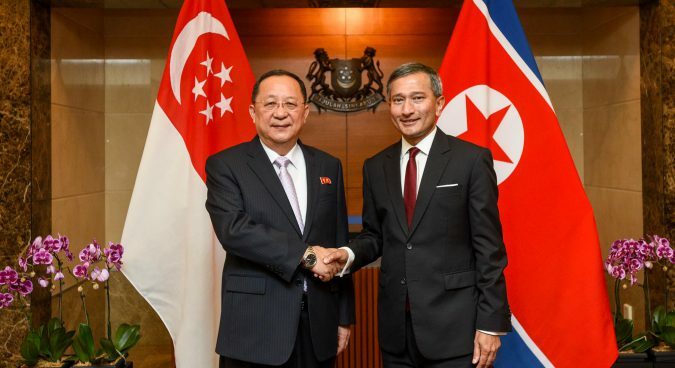 Singaporean Foreign Minister Vivian Balakrishnan on Monday, in turn, also held a “quick meeting” with DPRK foreign minister Ri Yong Ho, four days after the two met in Pyongyang. Meanwhile, officials from North Korea and the U.S. met for working-level talks in Singapore at 1000 local time, a diplomatic source familiar with the issue confirmed to NK News on condition of anonymity. Sung Kim, who served as U.S. ambassador to South Korea and chief nuclear negotiator, led the U.S. delegation, and met DPRK Vice-Minister of Foreign Affairs Choe Son Hui. Both parties have several times in recent weeks held talks at the truce village of Panmunjom. Also present, photos of the talks later revealed, was Choe Kang Il, who serves as interim Director-General of the DPRK foreign ministry’s North American Department. U.S. Assistant Secretary of Defense for Asian and Pacific Security Affairs Randall Schriver and other officials were seen by NK News leaving the Shangri-La Hotel around 0930. American officials declined to comment on the ongoing working-level talks between Pyongyang and Washington. 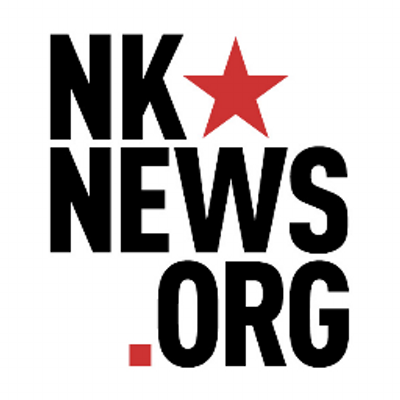 “I’m not gonna be able to comment on anything,” Schriver told NK News. 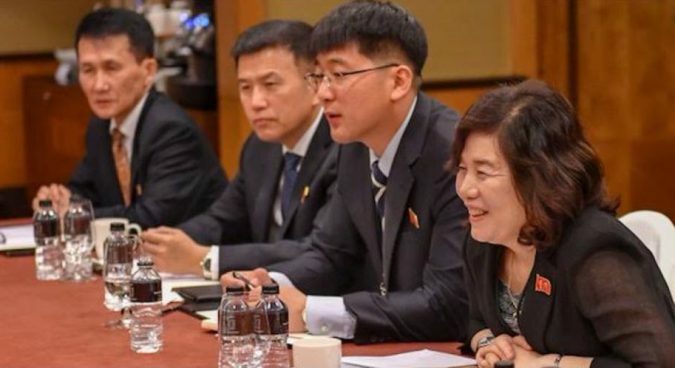 A diplomatic source in Singapore on Monday told NK News, however, not to “put a great significance” on the working-level meetings. Tuesday’s summit, they insisted, was “most significant” given North Korean leader Kim Jong Un’s position as his country’s top decision maker. The ongoing working-level talks lay a basic foundation for the summit, they continued, but Pyongyang and Washington have agreed to take a “top-down” – rather than bottom up – approach. They also expressed skepticism in response to media reports that Kim was scheduled to depart Singapore at 1400 local time on Tuesday. When asked whether Kim may seek to meet with Chinese President Xi Jinping, the source said any third Sino-DPRK summit would hinge upon the success of Tuesday’s meeting. Senior South Korean officials, including Second Deputy Chief of the Presidential National Security Office Nam Gwan-pyo, are also staying in Shangri-La Hotel – U.S. President Donald Trump’s temporary residence ahead of tomorrow’s summit. Nam and other South Korean officials were seen leaving the hotel at around 1030 local time, though NK News couldn’t independently verify their initiary. The South Korean government is operating a separate press center in the city for local and foreign outlets based in the ROK. Nam is scheduled to hold a briefing on upcoming U.S. – DPRK summit at 1630 local time.